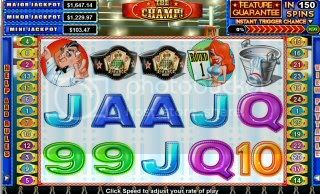 at Buzzluck Casino and powered by NuWorks Gaming Software. to right apart from scatters which may appear anywhere. so if you wish to bet all paylines the maximum will be $25 per spin. When three or more Bell symbols appear, you will win 12 free spins. 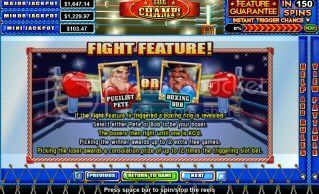 manage to get Pete or Bob on reels 1 and 5 during the free spins feature. You will then have to choose whether Pete or Bob will win the fight. loser will reward you with 12 times your trigger bet. trigger allows you to try to trigger the free games at any time. players there is currently a 20% cashback bonus. Looks like a good one for the guys though! Thanks for your input Pixie, and am glad you enjoyed playing it hon. I absolutely LOVE THIS GAME. At any of the Nuworks casino's. I just spent my free bonus for Lucky Club, almost entirely on this slot. I even made it thru more than half my playthrough.